Just 24 hours go I was posting the welcome news that Sierra Leone had just passed the requisite 42-days-without-a-new-case milestone, and for the second time in 2016, all of West Africa was technically free of Ebola transmission. A fleeting victory that, just as we saw last January, evaporated within hours, as last night we got the news that at least two new Ebola cases has surfaced in neighboring Guinea. Conakry — WHO has dispatched a team of specialists to the southern prefecture of Nzérékoré after 2 new cases of Ebola were detected and confirmed in a rural village. Guinean health officials in the region alerted WHO and partners on 16 March to 3 unexplained deaths in recent weeks in the village of Koropara and said other members of the same family are currently showing symptoms characteristic of Ebola. Guinea’s Ministry of Health, WHO, the US Centers for Disease Control and UNICEF sent in investigators on 17 March. Samples were taken from 4 individuals. A mother and her 5-year-old son, relatives of the deceased, confirmed positive for Ebola virus disease in lab tests. The 2 have been taken to a treatment facility. In coordination with Guinea’s Ministry of Health, WHO has deployed an initial team of epidemiologists, surveillance experts, vaccinators, social mobilizers, contact tracers and an anthropologist today to support an inter-agency response. More specialists are expected to arrive in the coming days. Response teams will work to investigate the origin of the new infections and to identify, isolate, vaccinate and monitor all contacts of the new cases and those who died. Guinea’s National Emergency Response Centre is convening a meeting 18 March to further coordinate a rapid response to contain the country’s first re-emergence of Ebola since its original outbreak was declared over on 29 December 2015. The new infections in Guinea were confirmed the same day that WHO declared the end of the latest Ebola flare-up in neighbouring Sierra Leone. WHO said recurrences of the disease should be anticipated and that the 3 Ebola-affected countries must maintain strong capacity to prevent, detect and respond to disease outbreaks. 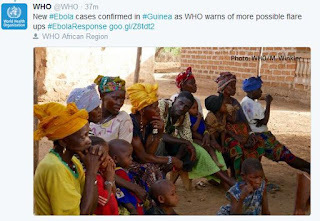 “WHO continues to stress that Sierra Leone, as well as Liberia and Guinea, are still at risk of Ebola flare-ups, largely due to virus persistence in some survivors, and must remain on high alert and ready to respond,” WHO said in a statement. The worst Ebola outbreak in history first began in Guinea in December 2013 and has since claimed more than 11 300 lives, mostly in Guinea, Liberia and Sierra Leone.